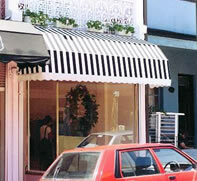 Fixed awnings are not retractable and have a fixed rigid frame. 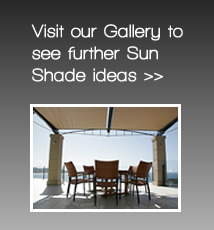 They are more robust than retractable awnings as they are designed to cope with the harshest conditions. Ozsun offers two different types of fixed awnings. 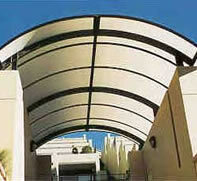 The traditional Canopy Awning and Carbolite Awnings. Canopy Awnings have fabric attached to an aluminium frame. Carbolite Awnings have twin walled polycarbonate sheets attached to an aluminium frame. An awning can provide shade without shutting out the view. An awning can give excellent privacy when required. Awnings can turn terraces and balconies into airy attractive, extra rooms. Awnings provide a sheltered place for children and pets to play, sheilded from direct sun. Carbolite awnings use twin walled polycarbonate sheeting to produce a variety of awnings and roof structures. Carbolite awnings are most suited to applications where rain protection is required without blocking out the natural light. Canopy awnings consist of a fabric covered aluminium frame. They are custom made in a variety of shapes and sizes. The most popular being the traditional Dutch and the semi circular Cupola canopy awnings.